Last summer I had the pleasure of meeting back up with Amanda and Dylan for their wedding! 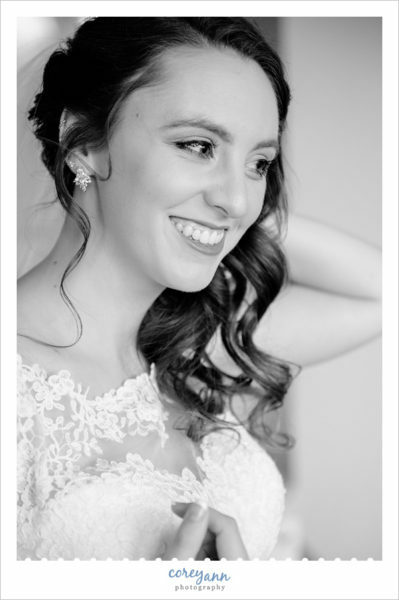 It was SUCH a perfect day – from the weather, to the lovely family, to the easy going bridal party! 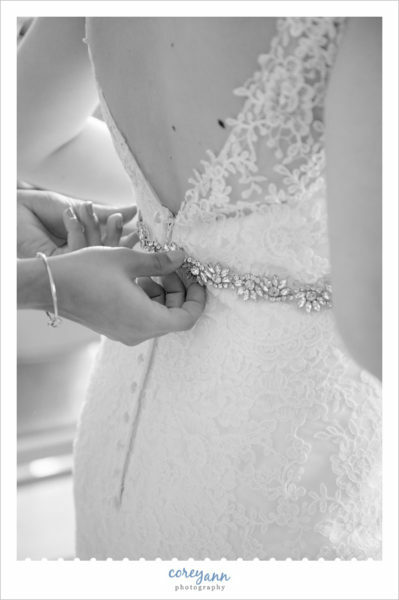 They opted to do a first look which made the day a breeze as well – even the family portraits were able to be done before so once the ceremony started they were with their friends and family celebrating until the end. All day the smiles that Amanda and Dylan shared told their love story. Every time they caught one another’s eye there was a huge smile and a happy gleam in their eyes that said so many words without a single word actually being spoken. It was a beautiful day all around with so many great people. Thank you so much for trusting me to be a part of your day! 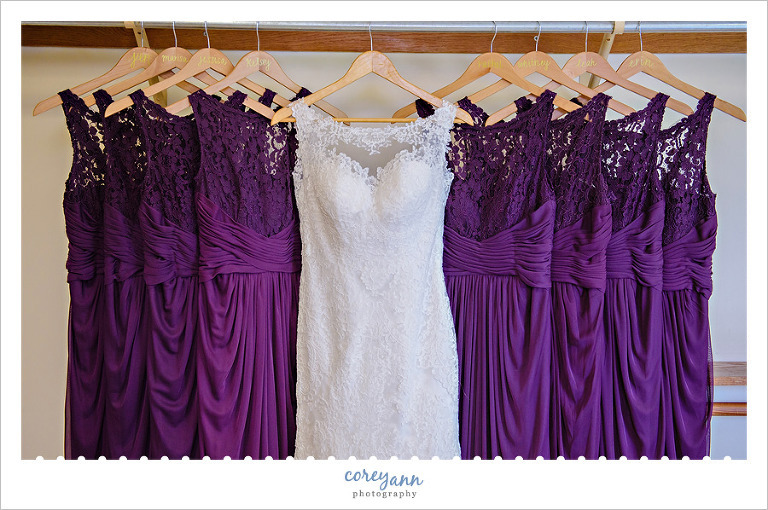 I loved how Amanda’s gown and the bridesmaid dresses complemented one another. Check out the adorable custom hangers! I loved that they didn’t have the flimsy metal! Amanda got ready at St. Nicholas in the basement and the light was beautiful! The final touch of the gorgeous belt! They did their first look in front of the church on the steps and it was perfection! We did a few photos on the steps which are beautiful! I LOVED the look of this bridal party! This bold purple and grey was a great color combination! Believe it or not this is a beautiful little area of the parking lot that was perfect for our needs! I love when I can show off the ladies hair and backs of the gowns! The guys looked dapper in their suits. 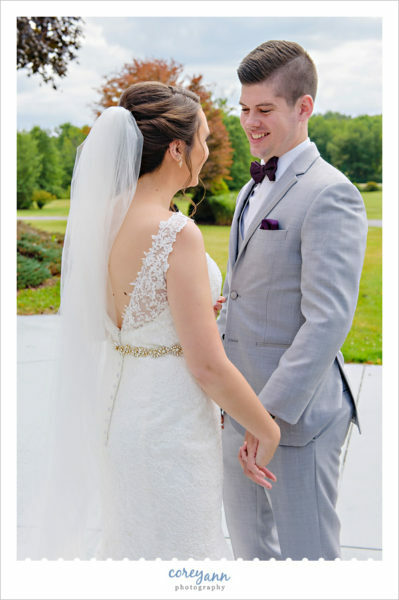 I really liked how Dylan opted for grey instead of the usual go-to of white for the groom! He still was offset but looked fantastic. Such a fun group of guys! As always, Nikki’s Perfect Petal Designs hit it out of the park with the florals. Here is Amanda’s beautiful cream and lavender bouquet! And this is the stunning bridesmaid bouquet! LOVE! I sent the bridal party back in and finished up with Amanda in Dylan in the wooded area before the family portraits. I really love this casual but perfect portrait of the two of them! A perfect dip before we headed back! Man do I LOVE Orthodox churches. They are SO beautiful! Their ceremony was so beautiful! They paused on their way down the stairs for a kiss during their bubble exit. It was perfect! I managed to get to Guy’s Party Center before many of the guests so got to get some images of the gorgeous ballroom before anyone arrived. They opted for uplighting and I LOVED the look of it! The tables were perfect – the purple table numbers were a cute touch! They opted for cupcakes instead of a large cake and they were delicious (I may have snuck one!). Their first dance was full of love and kisses, as all first dances should be. They did have a beautiful smaller cake to cut, I loved the ombre purple layers! They danced with their parents. After the formalities were over On the Mic Entertainment kicked off the party and the dance floor was PACKED all night long! Of course before I left I played with their rings for a bit and really loved this one with all the fun uplighting coloring the image!